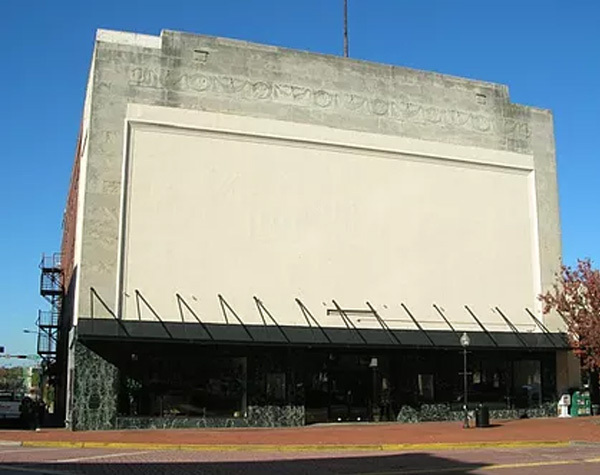 In 1901, Augustus Wardlaw Smith moved his department store from Abbeville to a two-story building on East Main Street in Spartanburg adjacent to the Palmetto Building. Co-owner H. Frank McGee served as proprietor of the store and quickly established the Aug. W. Smith Company as one of the leading department stores in the Upstate region. 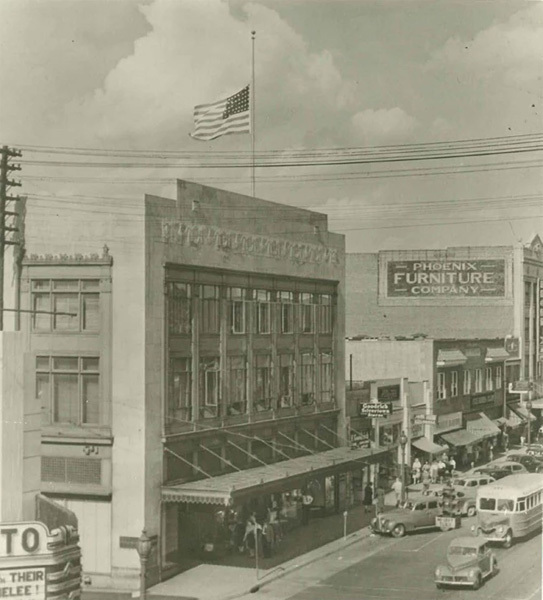 The store eventually outgrew its original space and, in 1926, moved into a new location further east on Main Street on the site of the demolished First Presbyterian Church. The new building at 174 East Main Street was designed by Lockwood, Greene, and Co., Engineers in Boston who had designed the recently completed Montgomery Building on nearby Church Street. 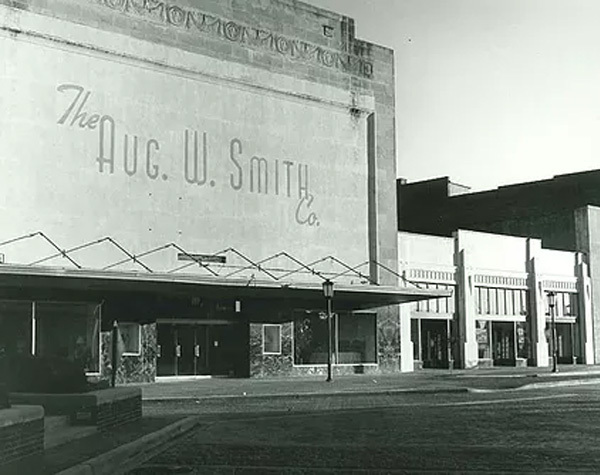 Aug. W. Smith operated in this location for over 55 years, until closing in 1981. The building later housed Bishop Furniture from 1984 until 2009. Aug. W. Smith was equally regarded for its high-quality merchandise and for its elaborate showcase window displays created by window designer and local artist James “Buck” Buchanan. The most well-known of these displays was a Christmas diorama of eight shadowboxes titled “A Visit From St Nick.” Buchanan created the miniature set around 1956 based on Clement Moore’s famous poem, and the display remained a Spartanburg Christmas tradition until the store relocated to the Hillcrest Shopping Center in the 1980s. Buchanan would go on to become the co-founder of the Spartanburg County Historical Association and led the effort to establish Walnut Grove Plantation as a historical site, serving as its first resident director. Buchanan’s background as both painter and storefront exhibit designer greatly influenced his unique approach as curator of Walnut Grove Plantation. The three-story Aug. W. Smith Building is constructed of brick and stone with a cast-in-place concrete frame and concrete floor slabs. A stone veneer commercial façade faces Main Street and turns the corner onto Liberty Street. The remainder of the Liberty Street façade and the Dunbar Street façade are brick with simply detailed flush vertical joints, cast stone sills and brick header coursing at the window openings. Historical photographs indicate that the stone veneer corner pilasters and stepped stone parapet with ornamental frieze and scrolls once framed the original Main Street and Liberty Street commercial bays. The first floor commercial bays featured a plate glass storefront with marble base, leaded glass transom, and large metal canopy decorated with glass pendants on Main Street. The second and third floor bays had large three-part wood casement windows divided by intersecting wood-paneled pilasters and spandrels that externally expressed the structural frame of the building. Above the third story bays was a projecting wood cornice and ornamental molding. The plain storefront, rectangular windows, externally expressed structural frame, and selective use of Romanesque ornament were exemplary of early 20th century Commercial Style American architecture. Although the original stone and brick facade remains, sometime prior to ca. 1945 the stone parapet scrolls were removed and the windows along Liberty and Dunbar Streets were infilled with brick. In the 1950s, air conditioning was added to the building, the original storefront was replaced and reconfigured, and the upper floor commercial bays were infilled and covered with stucco. Postcard History Series: Spartanburg, South Carolina - By Jeffrey R. Willis.